A sailing regatta crew has to work effectively together to make a yacht sail with maximum efficiency, stay on the course, to win the competition. Every member of the team working together, just as every piece of equipment working together on the yachts, is necessary to progress and navigate a successful course at maximum potential and efficiency. If working alone in this situation, each person, just as each piece of equipment of the yacht by itself, can do very little, or most often nothing, efficiently, nor effectively, much less successfully! The environment of very effective team building facilitators, and a complete sailing yacht in these competitive events, creates situations for a variety of object lessons that demand working together as an effective team at many levels. 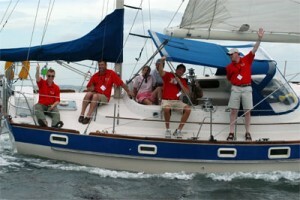 These principles and practices lend themselves so perfectly to business, corporations, companies, and every endeavor, and is easily seen and experienced for the racing crew navigating a yacht in these competitive sailing regattas; everyone is equally important, as no one can produce as effectively alone as they can as a member of an efficient sailing team. This principal, as well as many other key business pricipals, are demonstrated to, and experienced by, the company teams that work with us here throughout our corporate team building programs in Miami throughout the corporate team building regattas that we conduct here throughout south Florida and Miami. Together Everyone Achieves More = T.E.A.M. 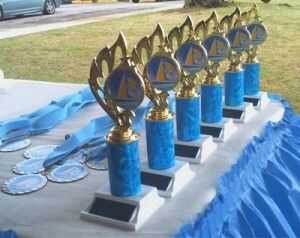 Trophies and medals are part of the experience.